Season the salmon fillets with salt and pepper to taste, lay them down with the skin side up, top with the mixture of the ricotta, parmesan, basil, lemon zest, salt and pepper, several spears of asparagus and roll them up before placing them on a grease baking sheet with the seam side down. Bake in a preheated 425F/220C oven until the salmon is just cooked, about 15-20 minutes. Meanwhile, melt the butter in a small sauce pan over medium heat, add the mixture of the broth, lemon juice and corn starch and heat until it thickens, about 3-5 minutes. 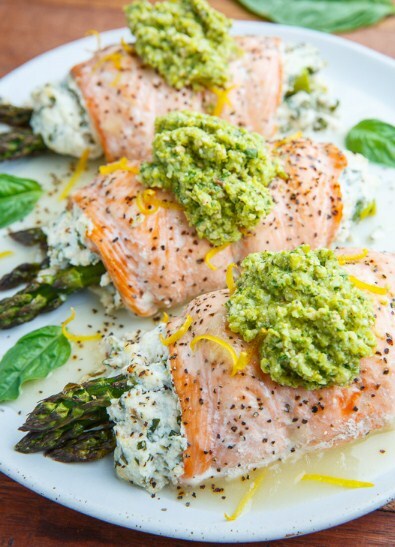 Serve the salmon rolls topped with the lemon sauce and optionally garnish with more basil and lemon zest.